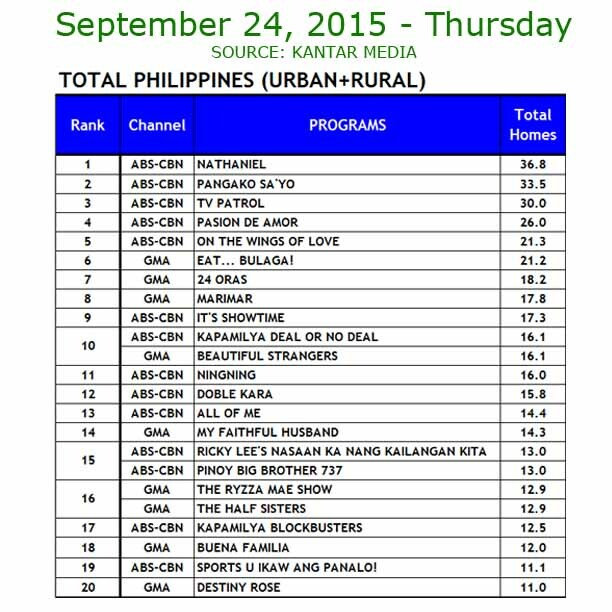 MANILA, Philippines - Noontime viewership heated up anew on Saturday, September 26, 2015 as ABS-CBN's 'It's Showtime and GMA Network's 'Eat Bulaga' clung on to prove supremacy in national TV ratings. 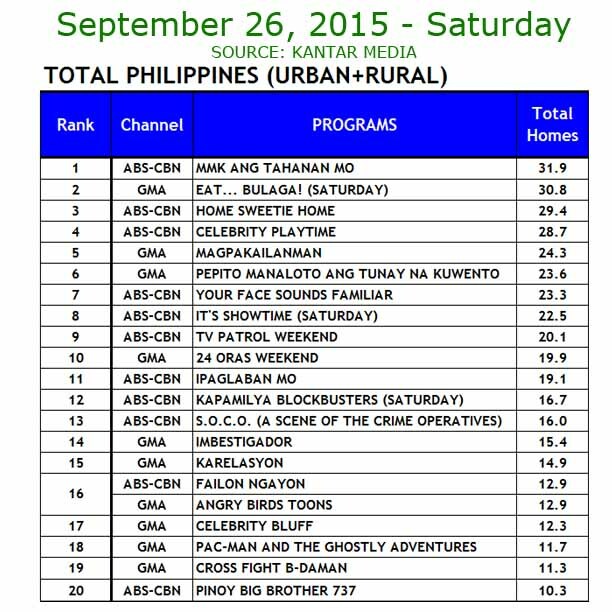 Ratings provider Kantar Media reported that 'It’s Showtime' significantly increased its viewership with its ‘ANIMversary’ kick-off held last Saturday at the Araneta Coliseum and scored a national TV rating of 22.5%, up from its average 18% weekday rating. 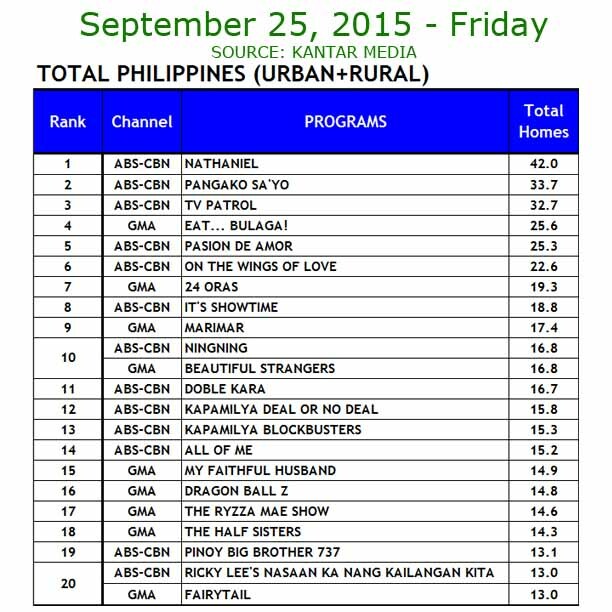 Eat Bulaga on the other hand garnered 30.8% rating to top daytime block and ranked second in over-all Saturday viewing. Kapamilya stars and country's most popular loveteams James Reid and Nadine Lustre (JaDine), Enrique Gil and Liza Soberano (LizQuen), and Daniel Padilla and Kathryn Bernardo (KathNiel) spread 'kilig' and triggered loud cheers at the Big Dome as the pairs shared the same stage in the same production number. 'Ang Probinsyano' star Coco Martin also serenaded Angelica Jane Yap, commonly known as Pastillas Girl in the trending interactive segment “Nasaan Ka Mr. Pastillas?” of the Kapamilya noontime show. 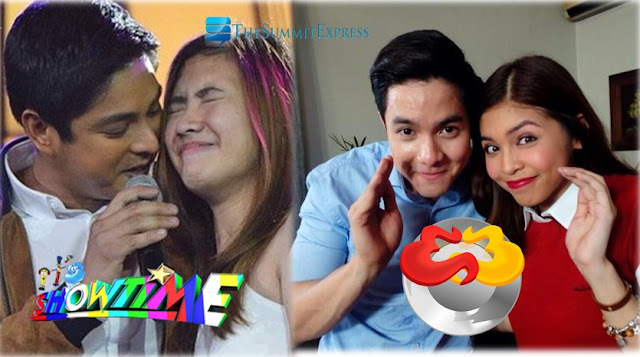 Eat Bulaga's surge in TV ratings was attributed to the popularity of its 'Kalyeserye' tandem Maine 'Yaya Dub' Mendoza and Alden Richards known as AlDub. On its Saturday episode, Alden visited Yaya Dub in the mansion of Lola Nidora (played by Wally Bayola). Their second date also received highest recorded number of tweets for '#ALDubEBforLOVE' with over 25.6 million according ALDUB STATISTICS, a Twitter account that tracks tweets for AlDub hashtags. Drama anthology 'MMK' claimed the number one spot on the list of most watched programs in the country as it featured the life story of banana cue vendor turned “The Voice Kids” season 2 champ Elha Nympha. 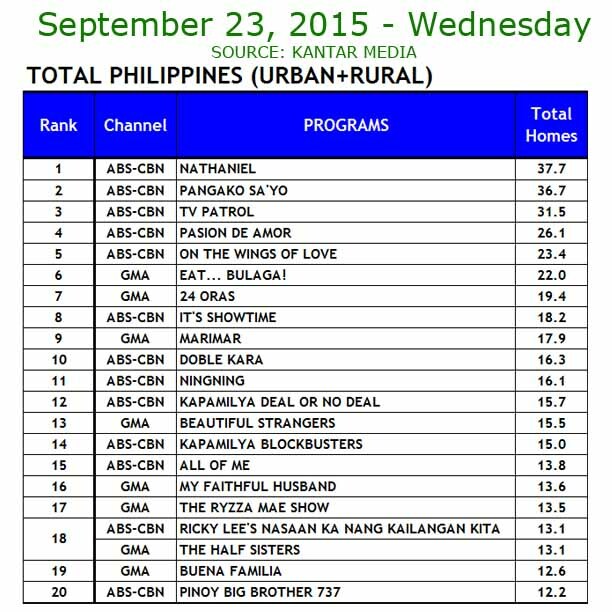 ABS-CBN’s consistent top-rating primetime series “Nathaniel” became the most watched program in the Philippines last Friday (September 25) as its highly anticipated finale scored an all-time high national TV rating of 42%, almost triple the rating of its rival program “Marimar” (17.4%), according to data from Kantar Media.